If your puppy is biting and nipping you are not alone. These types of behaviors are extremely common but also very frustrating to deal with. If you are a new puppy owner, it can seem even harder. There is no one perfect method for training a puppy not to nip or bite. Combining several different approaches is often the key to success. At least part of the issue is that all dogs have their own personalities so some are naturally harder to train than others. While some dogs may just stop using the yelp method others may require harsher treatment such as spraying objects with sour tasting sprays. First, let’s look at why puppies most commonly bite or nip and then go on to the methods you need to correct the behavior and raise a great dog! Your puppy is growing and changing fast. As puppies start to grow teeth they need things to chew on and will try just about anything. The chewing action is soothing to their gums and even helps dislodge puppy teeth faster. If they are not chewing on you then it might be your shoes or a child’s toy. Pups are trying to find their place in the world and that means establishing dominance where they can. Dominant behaviors is how they express themselves with other puppies and dogs so if you are interacting with them or they are playing with kids, this behavior naturally comes out. If you react to chewing or nipping with a positive attitude or a reward then you are encouraging the behavior. While play chomping and chewing may seem cute when a puppy is really young, they are going to grow up and if they get attention and played with when they nip and chew at you, they will learn to do it whenever they want your love. Having a puppy in the home means you need to take some extra precautions to prevent them from getting into things they shouldn’t and chewing up the place. Here are some tips for puppy proofing that will make their chewing phases go a lot smoother. Secure all cleaners, rags. sponges, mops, etc. Puppies will get into cleaning supplies. While some cleaners and applicators may be off-putting there are plenty of cleaners, soaps, etc that a puppy might chew into and get a nasty surprise or even poisoned. Make sure cleaning supplies are in cabinets that pooches cannot get into. Don’t underestimate your puppy. If there is a way to nose something open, then it needs to be more secure for the safety and health of your puppy. Shoes are a classic forbidden chew toy for a puppy. It is easy to see why puppies are so attracted. Shoes are on the floor where they are, smell like you or a family member, and are sometimes even made of leather. At the very least shoes provide a cushy chewing outlet. Only leave out shoes you don’t care about or just leave shoes on the floor when you are testing your puppy to see their reaction. Losing a $20 set of house shoes is one thing, a $200 pair of boots is another story altogether! Kid’s toys look a lot like puppy toys. It is a good idea to be better about keeping toys picked up when not being used. At the very least, explain to your kids the dangers of leaving out favorite toys where the puppy can get to them. Smaller toys can even be a choking hazard to puppies so take extra care when it comes to puppies being around kids play areas in the home. 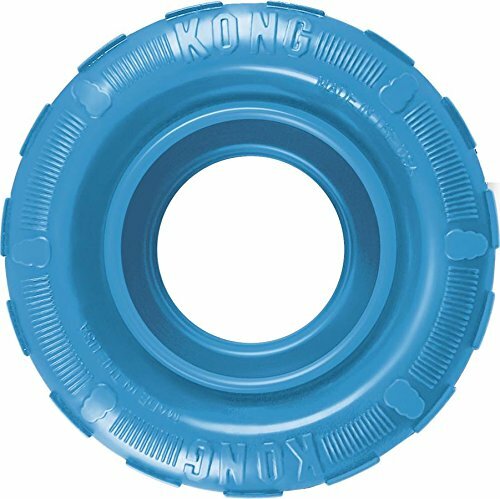 This adorable tire-shaped chew toy can be packed with favorite treats, peanut butter, or any of the Kong brand of dog treats. The round shape makes it easy for puppies to carry this around and have some fun with it. 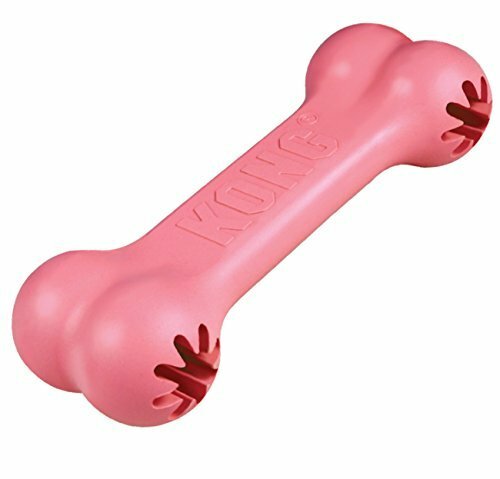 A classic cute bone shape with room for goodies will become your puppies favorite chew toy around the house. If you have ever watched many puppies or younger dogs playing together you might have noticed that they bite and nip each other a lot. This often continues until one puppy yelps and then both the nipper and the nippee (if you will) stop. This is how puppies test boundaries and learn what is okay and what is not when it comes to biting. You can use this ingrained behavior to train your puppy in a way that is easy for them to understand. To do this simply yelp or cry out when your puppy nips or bites in a way that is not acceptable. Over time they will learn how hard they can play with people. Keep in mind that you should set your limits low because what doesn’t hurt to you could hurt a child or other animal. You are going for a gentle and loving grown dog! Stop playing with your puppy or give them a time out in another area after you yelp. Show kids and other household members what to do when the puppy gets too rough. If everyone has the yelp reaction, training will go even faster than if just one person is doing it. Aggression in your puppy is something you have to take seriously before they become an adult dog that can do more harm. There are a variety of sprays out there that can be safely used around the household to make everyday objects taste objectionable to puppies. Chewing on power cords and wires is something puppies will sometimes do. Of course, the risk of shock is a concern. If your puppy seems to be interested in power cords you can spray all of them down with Sour Apple or other sprays and it will leave an awful taste in their mouth. Caesar Milan encourages pet parents to use this method the right way if they are going to try it. Here are a few things he recommends. 1. Spray or apply the product to a cotton ball or small piece of cloth and put it under your puppy’s nose and then in the mouth. They will spit it out and associate the smell with something that tastes bad. This may prevent them from even trying out anything that remotely smells this way. 2. If you notice your puppy has licked or even briefly put anything into their mouth that you have sprayed with the bitter product, take away water for up to an hour. Caesar says this may seem cruel to some but if pups get the idea they can just rinse their mouth out and go back to doing what they want to, the spray may become completely ineffective in correcting the behavior. 3. Keep objects sprayed for 2-4 weeks to train your puppy. Some puppies get the idea faster than others so it may take even less time for some, especially if you are combining the spray with other methods to deter chewing and biting. Here are few sprays Scout recommends for training. There are plenty of sprays out there but Grannick’ is the bestselling dog deterrent spray on Amazon so that is saying something. The classic bitter apple formula goes a long way and will not cause any real harm to your dog. Simply spray on whatever you want to protect. Most dogs hate this stuff but beware that some pet parents have reported their dog doesn’t seem to mind it. You can always try the Lemon variety described next if this flavor doesn’t have the desired effect. 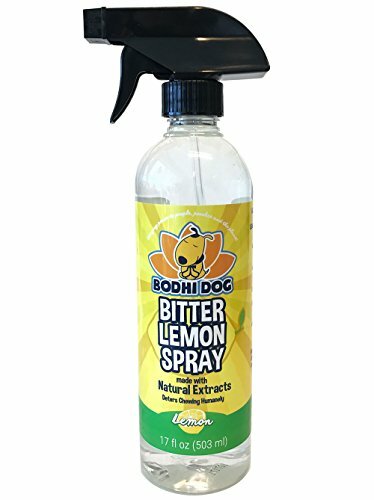 For those that prefer lemon scents, there is Bodhi dog. It is considerably more expensive than Grannick’s Bitter Apple but a bottle of any of this stuff is going to go a long way as it is very concentrated. You are going to be smelling it a bit over the course of 2-4 weeks so it is best to pick a spray and scent you can live with the easiest. If your puppy starts chewing on something they shouldn’t or nipping at you then you should give them an alternative. For example, if a puppy is chewing on a shoe then go over and take the shoe from them and say No then give them something they are allowed to chew on. Puppies need healthy toys to chew on and if they are not being provided with these they are far more likely to find something of yours to gnaw on because they don’t have a choice. If you are watching your favorite show and your puppy starts nipping at your fingers, give them their toy. They will learn that chewing is okay within limits. Ankles are tempting targets, especially for dogs that are naturally short anyway. Puppies are all at this level at some point but smaller breeds stay there and it continues to be easy for them to get at ankles. If your puppy starts nipping at your ankle, reach for their favorite toy if nearby and wave it behind you so they latch on to that. If a toy is not near at least stop moving and get the puppy to release you. Offer praise or a small treat when they do as asked. Positive reinforcement goes a long way when it comes to breaking bad behaviors. You may even want to spray the bottom of your pants or your shoes with bitter spray to deter them as well. Having a puppy is a lot of fun but that fun comes with some work as well. Scout hopes that this post has helped you have a better plan and strategy for getting you and your puppy through the chewing and nipping phase. Just like us people, puppies learn at different speeds and some learn better one way than others. Being consistent in your own behavior when your puppy does something they are not supposed to is one of the best things you can do to help them grow up to be the best dog they can be!